Lamborghini has done the decent thing and chopped the roof off the Huracan Evo. The coupe emerged just a couple of months ago but this Spyder variant adds a big slice of extra drama. It maintains the Evo coupe’s 631bhp V10 in the middle, making it more powerful than the most potent Audi R8 cousin car and 29bhp better off than the old Huracan. The added weight of the additional chassis bracing in the Spyder adds two tenths to the 0-62mph time versus the hard-top Evo, but its 3.1-second stat is plenty brisk enough. 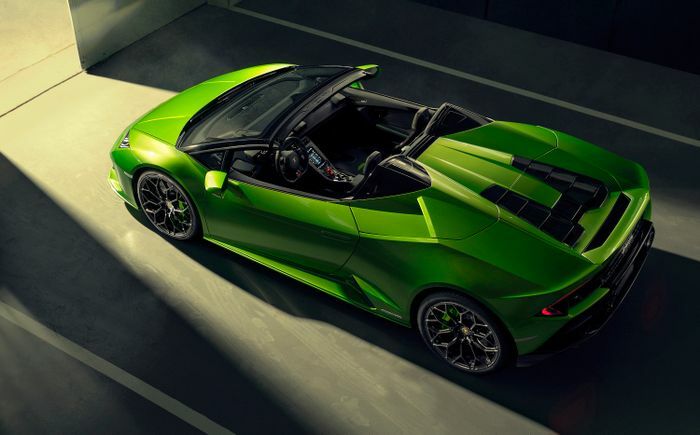 Top speed is 202mph but Lamborghini doesn’t specify whether that’s with the roof down. We suspect not. Elsewhere the story mirrors that of the Huracan Evo coupe. 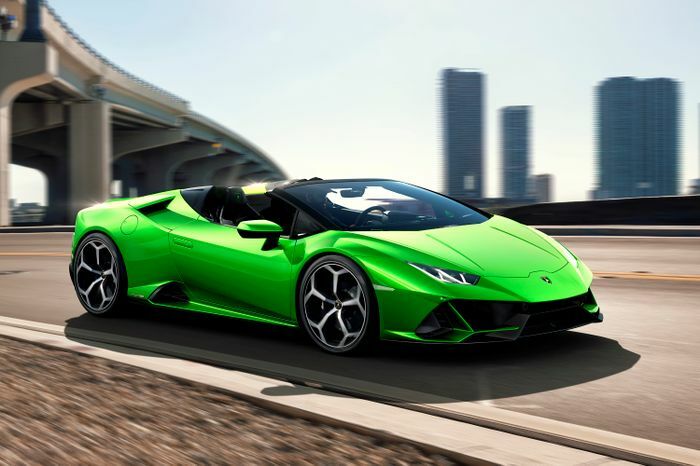 Rear-wheel steering is a feature new to the Evo duo, in tandem with a four-wheel torque vectoring system controlled by Lamborghini Dinamica Veicolo Integrata software, or LDVI. It ‘anticipates’ the driver’s next move and continually adapts the chassis setup to suit. 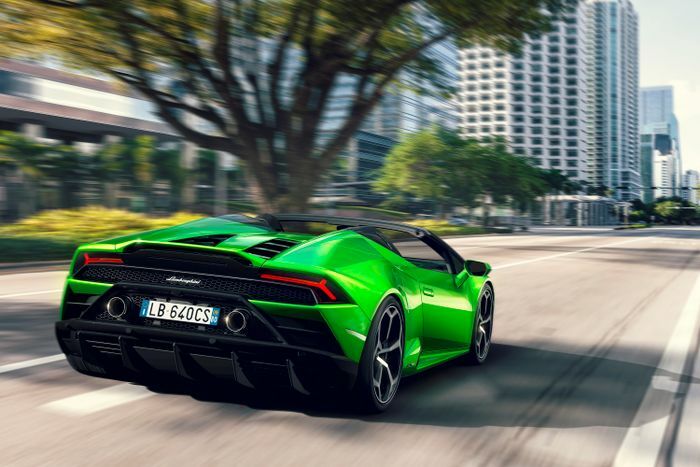 More sensors are contained within the LPI, or Lamborghini Piattaforma Inerziale. This ‘v2.0’ upgraded system of gyroscopes measure acceleration in all directions. The car’s brain then uses the data to instruct the (also v2.0) magneto rheological suspension to adapt to suit. Traction is always monitored closely. Power can be sent to individual wheels as required, which is nice. Not so rosy is the Lamborghini Dynamic Steering, a Marmite setup that few people actually seem to prefer over a decent passive option. As with the Evo coupe there are three driving modes within the Anima selector system. Strada is good for general street use, Sport for being noisier and drifting a bit at the limit, and Corsa is the track mode that sets everything to ‘rock solid’ and punches you in the kidneys with every gear shift, Aventador-style. The Spyder definitely isn’t just a pretty face. 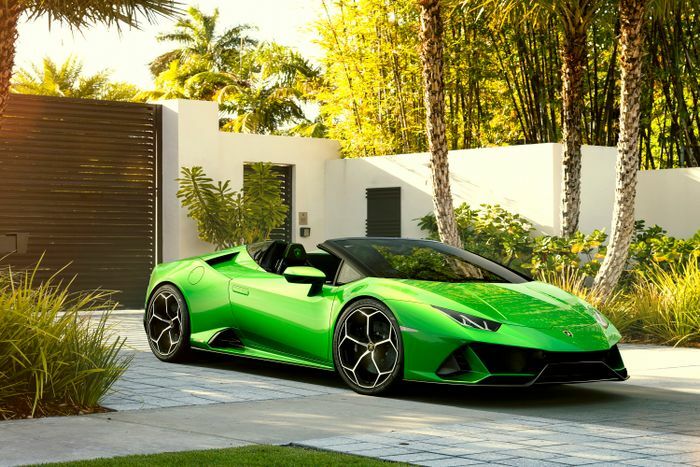 Bodywork and aero revisions mean it actually has five times the amount of downforce of the original Huracan Spyder along with a reduction in cabin buffeting. The canvas roof folds down in 17 seconds at up to 31mph. Needless to say, there’s a whole catalogue of options and personalisations that buyers can add, from a barely controlled hosing of carbonfibre to the smallest of bespoke, inlaid trim details. Prices have been confirmed. 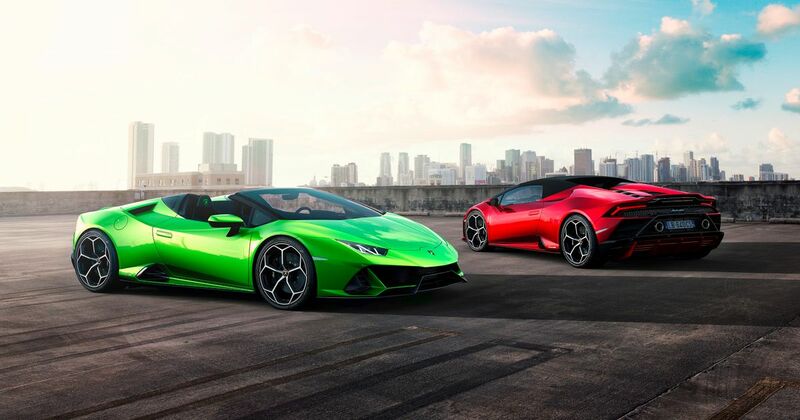 In Europe the Huracan Spyder will cost €202,437, in the UK it’s £181,781 and in the USA you’re looking at $287,400. But wait, there’s more – you’ll need to add your country’s tax rates (20 per cent in the UK) and delivery charges onto that. Plus your options. Probably best to just hand over a blank cheque.